Jump Sucker Stable's Blacktype picked up his second straight win of the Fall Championship meet at Belmont Park with a one-length victory in the Grade 2, $200,000 Knickerbocker at 1 1/8 miles on the inner turf on Monday's Columbus Day holiday card. With Joel Rosario aboard, Blacktype settled in second early, tracking the frontrunning Hello Don Julio through an opening quarter-mile in 24.27 seconds and a half in 49.14 with 2-1 favorite Forge and Muqtaser lying in wait just behind. After six furlongs in 1:13.84, Blacktype hit the top of the stretch a head in front and prevailed in a stretch duel with a stubborn Hello Don Julio to complete 1 1/8 miles in 1:50.33 over the turf listed as good. Muqtaser rallied late to secure second, a neck ahead of Hello Don Julio in third. Off at 5-1, Blacktype returned $12.80 for a $2 win wager. "The race shaped up how we expected it to," said Rosario, who picked up his second race on the card following The Berber's win in Race 5. "I broke well and then the 1 horse [Hello Don Julio] showed a little speed, and we kind of just went along a little bit with him, and after that he just did the job. It was easy." 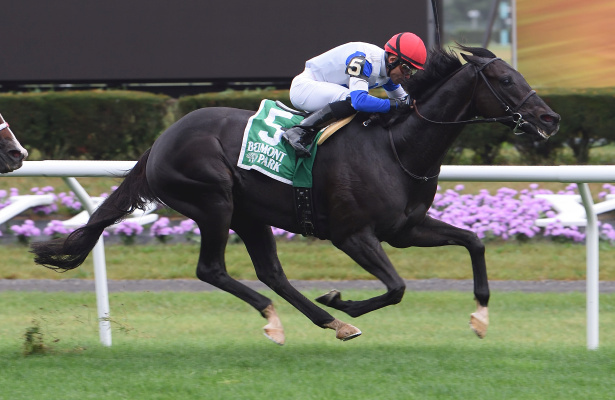 The win, Blacktype's first in a graded stakes since taking the Grade 2 Commonwealth Turf in September of 2016, followed a one-length allowance score on September 9 for the Christophe Clement trainee, who finished third in last year's Knickerbocker. "He handled the [ground] really well and he ran a big race," Rosario added. "Last time he got a win and now he stepped up to a graded stakes. He's a nice horse. I work him in the morning [for] Christophe and he has a nice gallop. He's a cool horse." A French-bred gelding by Dunkerque, Blacktype improved his career record to 9-3-8 from 28 starts for lifetime earnings of $739,065. The victory was Clement's sixth in the Knickerbocker, following River Majesty (1993), Charge d'Affaires (1999-2000), Operation Red Dawn (2009), and Za Approval (2013). "We were waiting all year long for that," said Clement. "It was a good performance. He's a good horse. He's had fine races on firm and soft. [The rain] wasn't that much of a concern. "I thought he got into a good tactical position," he continued. "He opened up well. I'm delighted. It took a while to get him back to where he's supposed to be. He was unlucky at Saratoga. Sometimes, you need to be lucky as well. I loved his last race. He had a great prep race four weeks to this race. It worked out." Spring Quality was another 2 ¼ lengths back in fourth, followed by Camelot Kitten, Smooth Daddy, Forge, Sir Dudley Digges, and The Grey Gatsby to complete the order of finish. Mark My Style and Delta Prince were scratched, as was main track only entrant Vulcan's Forge.